If you are experiencing the onset of cataracts you know how difficult seeing can be. You may be struggling with night vision or you might not be able to tell the difference between pairs of socks. You may even have sensitivity to sunlight. Fortunately, cataract surgery can help you to regain what you’ve lost, both in terms of your vision and your quality of life. Now, a technological breakthrough is available for use in cataract surgery. San Diego Eye & Laser Center is among the first practices in the United States to have this breakthrough technology. When you choose to have your surgery performed with a femtosecond laser, you’ll enjoy a truly innovative solution that allows for customization in cataract surgery. A bladeless, computer-controlled laser allows Dr. Leung to plan and perform your surgery to exact individualized specifications, not attainable with past cataract surgery methods.â€¨â€¨ With the femtosecond laser, you can move forward with confidence knowing that you’ve chosen the most advanced technology available for this life-changing procedure, one that enables a customized cataract surgery experience. If you are seeking a San Diego cataract surgeon consider choosing the most advanced cataract surgery technology available right here with Dr. Richard Leung at San Diego Eye & Laser Center. The femtosecond laser offers you a precision based solution for cataract surgery. A bladeless, computer-controlled laser surgery planned and performed to exact individualized specifications, not attainable with other surgical methods. What makes refractive cararact surgery different than traditional cataract surgery? Your eyes can be compared to snowflakes! While all human eyes share the same basic anatomical structure, every eye is just a bit different in terms of size, depth, curvature of the cornea and other key features. Which is why every eye must be carefully measured and mapped prior to cataract surgery. While these measurements have been routinely performed prior to surgery, the femtosecond laser uses a range of highly-advanced technologies – including integrated optical coherence tomography (OCT) – to capture incredibly precise, high resolution images of your eyes. These images – and the measurements and data they provide – are then used by Dr. Leung to plan and perform a surgery to exacting specifications not attainable with traditional surgery. During both traditional cataract surgery and femtosecond bladeless cataract surgery the cataract is removed and a new lens is required. You will need to understand what your lens implant options. Fortunately, premium lens implant technology is now available to help you see without glasses at near, far and intermediate distances. Click here to learn more aboutr your premium lens implant options. You may also choose to consult Dr. Leung regarding premium lens implants options based on your unique visual requirements. In 1949 Harold Ridley implanted the first intraocular lens in London England. (International Intraocular Surgery Club) By 1952 the first intraocular lens was implanted in the United States. It amazing to think that lens implantation has been evolving for almost 60 years. Source - IIIC.org website information. Bladeless Cataract Surgery is performed in our surgical center and does not take any longer than traditional cataract surgery. You will most likely be in surgery for 20-25 minutes. Like traditional cataract surgery you should arrive about an hour prior to surgery. Upon arrival, you will be given a mild sedative to relax. Although the surgery takes only minutes, plan to spend 2 to 3 hours at the center for the preoperative steps and for recovery. 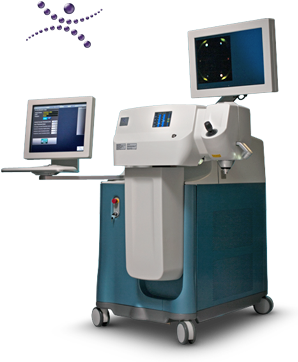 The femtosecond laser provides patients with computer-controlled precision as it automates some of the most challenging steps of refractive cataract surgery. The laser replaces the traditional hand-held blade to optimize all incisions for enhanced, reproducible surgical performance. This breakthrough technology provides Dr. Leung with real-time three-dimensional visualization for true customization of your lens replacement procedure. 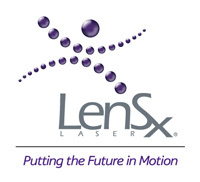 In addition to using the femtosecond laser to do many of the surgical steps traditionally performed by hand, we still use many of the best innovations in cataract surgery, such as drops, only anesthesia (no shots), sutureless incisions through the clear cornea and foldable intraocular lenses. These advances allow us to use the smallest possible incision, approximately 1/18th of an inch. Most patients are concerned about the cataract surgery recovery process. Dr. Leung at San Diego Eye & Laser Center provides the best quality care and thoroughly explain what you can expect after cataract surgery. Recovery from cataract surgery is generally very quick. Most patients obtain better vision within the first 24 hours of the procedure. Itching and mild discomfort are normal after cataract surgery. Some fluid discharge is also common. Your eye may be sensitive to light and touch. If you have discomfort, Dr. Leung can suggest treatment. After one or two days, any moderate discomfort should disappear. Complete visual recovery varies from patient to patient, but most patients return to their every day activities within a day or two. If you have cataracts in both eyes, the second procedure will most likely be scheduled within a week or two. We will schedule exams to check on your progress. Each person heals differently so it is important to discuss the cataract surgery recovery with your eye doctor. For a few days after surgery, Dr. Leung may ask you to use eye drops to help healing and decrease the risk of infection. Ask Dr. Leung about how to use your eye drops, how often to use them, and what effects they can have. You will need to wear an eye shield or eyeglasses to help protect your eye. Avoid rubbing or pressing on your eye. Serious complications are extremely rare, but because it is a form of surgery, there are some potential risks involved. We will provide you with additional information about the risks associated with cataract surgery and answer any of the questions you may have.